These Encounters are generic and meant to be used with any RPG system that uses a scale of 5 feet per grid square. Both of the locales featured in this bundle are depicted by maps that measure 24 x 24 squares, and the maps are offered in both a day and a night version. 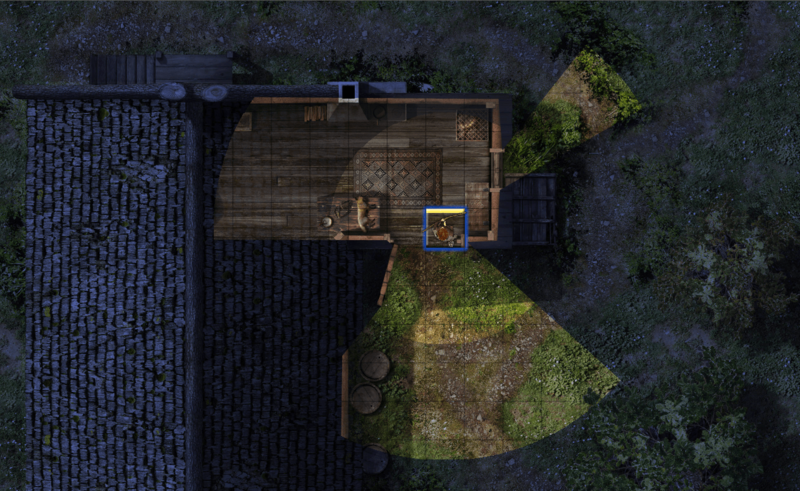 A third option for each locale uses a Fog of War Overlay to dynamically “light” the map as the PCs explore each area. The Encounters can be used to depict stand-alone locations, or they can be used to depict geographically adjacent areas (if the maps were placed beside each other, they would join seamlessly to form a 24 x 48 square map). The artwork is all high-resolution (122 pixels per cell), so it won’t pixelate even at full zoom in Battlegrounds. Audio clips of ambient sounds, for both day and night, are available in each Encounter to help set the mood. Many map elements (tree canopies, building roofs, attics, cellars, etc.) are presented as BRPG Objects that the GM can show or hide at will. Follow the links above to see additional preview pics of these maps. I think you’ll agree that Lord Zsezse Works produces some of the most gorgeous, exquisitely-detailed, and “realistic” RPG maps in the industry. This Encounter bundle costs $10 (but, like all artpacks, is free for players). Half of the proceeds will go to LZW, and the other half to support continued development of Battlegrounds.. Note that players will need to have this artpack installed during sessions where the GM will use it, and everyone should be using BRPG v1.8b or higher, or BGE v1.5 or higher (note that the Fog of War functionality is not available to BGE users). It’s worth pointing out that the Encounters in this bundle are not meant to present a ready-to-go adventure. Every GM will have to flesh out exactly what will happen at these locales, by adding appropriate NPCs, monsters, etc. (not provided). Will this be the scene of a last-ditch defense against werewolves, or perhaps zombies? An abandoned site where the PCs must discover what has befallen the local residents? Something else entirely? That is left up to each GM to decide and add themselves. The included Encounter files merely provide the GM professional-quality “interactive maps” to use as a starting point for their own custom encounters. If this artpack does well, Lord Zsezse Works will hopefully agree to release more Battlegrounds-specific content for us in the future. If you browse their product catalog on RPGNow, you will see that they have a vast body of work to draw from that was originally created for printing but could be readily converted for use in Battlegrounds. Lord Zsezse Works is “testing the waters” with this initial release, to see if it is a market worth pursuing. I hope the community response is a resounding “yes!”. Here’s another preview image, to illustrate what I meant when I said that you can use a Fog of War Overlay to dynamically “light” the map as the PCs explore each area. This method uses the night version of the map as a FoW Overlay, while exposing the day version of the map in the areas revealed by light sources. Make sure you click on the image to view it at full size.